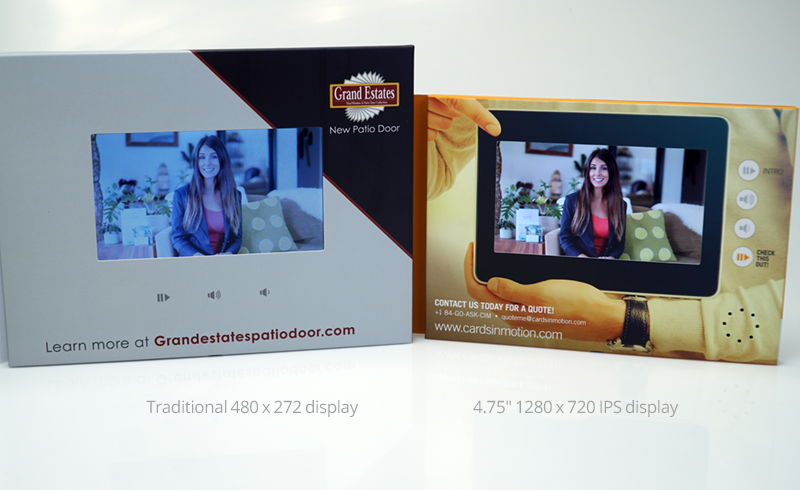 If you would like to achieve maximum impact with your video brochure, then look no further than the stunning 5″ 720P IPS LCD screen from Cards In Motion. This high quality IPS display delivers our most vivid picture quality to date in ultra-sharp 1280 x 720 resolution. This sleek, glossy screen has a comparable look and feel to today’s high-end smartphones, delivering crystal clear video and rich colour. Its modern IPS technology allows the display to retain its picture quality from any viewing angle, unlike inferior TFT LCD screens of the past. Choose the unmistakeable quality of our 5″ 720P IPS to raise the calibre of your project and give your recipients a first-class experience. Contact us for more information, or to feast your eyes on a sample! Cards in Motion creates custom video brochures tailored to meet your needs and budget. A video brochure is a high-quality printed card with an embedded LCD screen capable of displaying HD video and audio.